DETROIT – The Detroit Red Wings today assigned defenseman Jakub Kindl to the American Hockey League’s Grand Rapids Griffins. Additionally, the Red Wings activated defenseman Niklas Kronwall from injured reserve. Kindl, 29, has appeared in 25 games for the Red Wings this season, totaling six points (2-4-6), a plus-three rating, 14 penalty minutes, 13 hits and 15 blocked shots. The 6-foot-3, 199-lb., blueliner has also seen action in nine games for Grand Rapids this year, notching three points (2-1-3), 12 penalty minutes and 22 shots on goal. 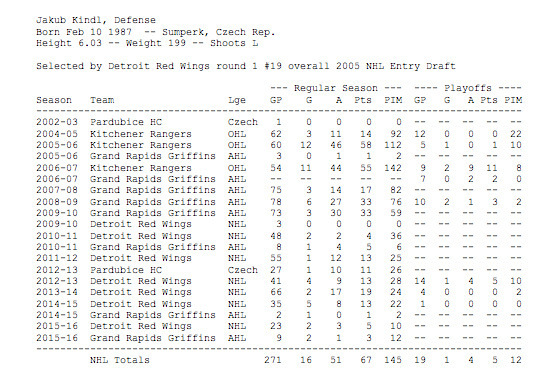 Kindl has skated in 273 games for the Red Wings since the 2009-10 season, logging 68 points (16-52-68), 149 penalty minutes and a plus-15 rating. He has also seen action in 19 postseason games over the past three seasons, notching five points (1-4-5) and 12 penalty minutes. The ninth-year pro has appeared in 138 AHL games for the Griffins since the 2005-06 season, totaling 93 points (16-77-93) and 239 penalty minutes and adding five points (2-3-5) in 17 postseason games. He was a 2009 AHL All-Star for the Griffins, posting an AHL career-high 33 points (6-27-33) in 78 games during the 2008-09 campaign.